Meanwhile, make streamers. Unroll 1 fruit snack roll, and cut crosswise into three 12-inch strips with a knife. Cut each strip lengthwise into 3 equal narrow strips. Roll each narrow strip in a spiral around handle of wooden spoon, then carefully remove from spoon, retaining curled shape. Reserve 1/4 cup frosting for party blowers. Place 1 cake layer, rounded side down, on serving plate. Spread with about 1/3 cup frosting. Place other layer, rounded side up, on top. Frost side and top of cake with remaining frosting. Press sugar sequins and colored sugars into frosting on side and along outer edge of top of cake. Make 6 party blowers. Tint reserved frosting with food color. For each party blower, break candy stick in half. Cut 2 chewy fruit snack rolls each into three 12-inch strips. Place a small amount of frosting 1/4 inch from broken end of 1 candy stick half. Wrap narrow end of piece of fruit roll over frosting. Pipe 2 rows of frosting stars over seam with decorating bag and star tip. Curl the end of the fruit roll to about 1 1/2 inches from star rows and secure with small amount of frosting if needed. Place party blowers on top of cake with candy sticks toward center of cake. 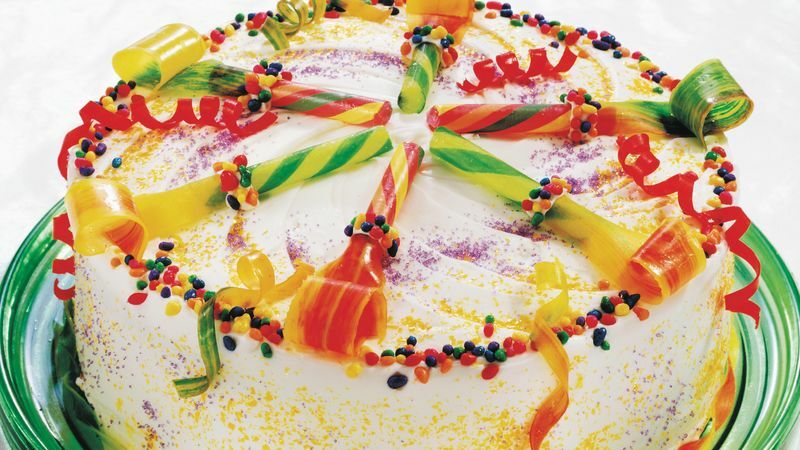 Reshape streamers into desired curl and place between party blowers and around base of cake. Any streamers draped over edge of cake can be lightly pressed into frosting to retain curl. Store loosely covered. Fruit snack rolls come in a variety of colors and flavors. Let the kids help pick out their favorites!